ALL THREE OF THESE STATEMENTS ARE MYTHS. None of these are instances when collecting information from website users is unregulated. For more information see: Privacy Policies are often required on Commercial Websites: http://wp.me/p10nNq-bL; The California Online Privacy Protection Act: http://oag.ca.gov/privacy/COPPA; CAN-SPAM Act: Compliance Guide for Business: http://www.business.ftc.gov/documents/bus61-can-spam-act-compliance-guide-business; Children’s Online Privacy: http://business.ftc.gov/privacy-and-security/children%E2%80%99s-online-privacy; EU ‘safe harbor’ arrangement: http://www.ita.doc.gov/td/ecom/menu.html; @iplegalfreebies and www.kasterlegal.com. An online following of over 617,000 folks can be a powerful negotiation tool. 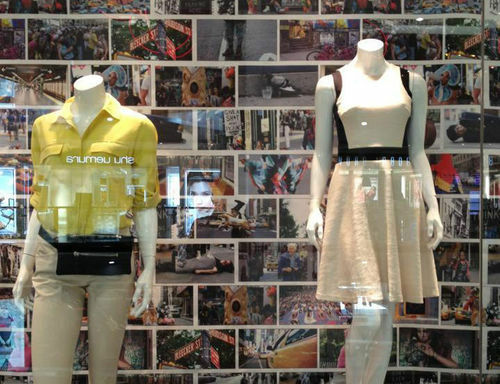 I read recently that a NY street- photographer leveraged his online following by “unleashing a viral whiplash” on DKNY for using some of his photographs in a Bangkok window display without permission. Evidently, DKNY approached the photographer for permission to use some of his photographs… but the parties couldn’t agree on a price and the deal fizzled out. Yet… some of the photographer’s photographs ended up being used anyway in the window display of a DKNY store in Bangkok. Someone who happened to be familiar with the photographer’s work (possibly one of the 617,000 folks who follow the photographer online) saw the images in Bangkok and notified the photographer. Today, a fan sent me a photo from a DKNY store in Bangkok. The window is full of my photos. These photos were used without my knowledge, and without compensation. I don’t want any money. But please SHARE this post if you think that DKNY should donate $100,000 on my behalf to the YMCA in Bedford-Stuyvesant, Brooklyn. That donation would sure help a lot of deserving kids go to summer camp. I’ll let you guys know if it happens. The online campaign quickly transformed into viral whiplash. The Facebook post garnered over 4,500 comments the same day that it was posted and was noticed and “liked” by over 41,000 folks and was shared over 30,000 times. Within four hours, DKNY issued a prompt apology and pledged to make a $25,000 charitable donation to the YMCA in Bedford-Stuyvesant Brooklyn in the photographer’s name. [Click to read DNKY’s statement issued at 12:52pm on 2/25/13 and the photographer’s response accepting the donation as a settlement issued at 1:18pm on 2/25/13]. Not the full $100,000 donation that was asked for… but a creative an interesting negotiation and resolution within FOUR hours. In support of this creative negotiation I “liked” the Facebook page for HUMANS OF NEW YORK, becoming follower number 617,012. See also, a creative resolution to a trademark infringement between Franklin & Marshall college and a hot European Brand at http://wp.me/p10nNq-lu; @iplegalfreebies and www.kasterlegal.com. If you want to cover a song on an album you will need to obtain a MECHANICAL license. The good news is that user-friendly tools are available to help you get the licenses you need. If you are an indie artist, attorney with a hankering to release an album, church group, or other musical group… you can use the online licensing services offered by Limelight (at https://www.songclearance.com/) to obtain mechanical licenses. You need a mechanical license before distributing a recording containing a song or composition that you didn’t write. The most common mechanical uses are digital downloads, CD’s and ringtones. You need to secure mechanical licenses even if you are giving your CD’s, downloads and ringtones away for free. If you wish to license a song or Master recording to use with a film or other visual content (including YouTube videos), the type of license that you need is a SYNCHRONIZATION license. (Contact the publisher directly for a synch license). If you are including a recording of someone else’s music in your album (for example within a track or as an instrumental line) you need a MASTER USE license, need to clear the publishing/composition rights AND secure a mechanical license. See also, https://www.songclearance.com/faq/; Rights Flow at htsflow.com/what-we-do/mechanical-licensing-and-royalty-services/; Three Myths About Music Sampling at http://wp.me/p10nNq-4U; Copyright Is Valuable – The Happy Birthday Song Earns $2 Million a Year at http://wp.me/p10nNq-cl and @iplegalfreebies and www.kasterlegal.com. Crowdfunding has taken off with websites like Kickstarter which allow entrepreneurs, inventors and creators to pitch their innovative ideas to potential funders/investors to raise start-up money for their projects. Kickstarter is an example of REWARD based crowdfunding which offers a reward to investors for their financial sponsorship. While reward crowdfunding may be the most well known and popular type of crowdfunding… another type of crowdfunding is EQUITY crowdfunding. As the name suggests, equity crowdfunding gives investors equity in the business being funded instead of a reward. The two types of crowdfunding are regulated differently because giving a reward verses a security or equitable interest invokes different laws and regulations. Each reward funding website operates differently. For example, the fees charged by the sites (generally in the range of 4%-9% of the money raised) as well as the sites policies for what happens to pledged contributions if the target goal isn’t met… vary website by website. Once an idea is posted to a crowdfunding website… it CAN be copied! (You must protect your Intellectual Property!)!! A few of the most funded reward crowdfunding projects earned over $1-$2 million dollars (the projects were for: a video game headset, an LED light bulb controlled with a smart phone and a 3D printer). Reward crowdfunding websites do not necessarily regulate fulfillment of the promised rewards. (In Quest v. Singh, the entrepreneur who wasn’t able to deliver promised rewards was sued by a funder and ended up going bankrupt). It can be argued that equity crowdfunding over regulates initial offerings by requiring a licensed intermediary, limiting the capitol raised to $1million a year, and placing significant burdens on the intermediary and issuers. (Title 3 of the JOBS ACT). SEEDERS (http://www.seedrs.com/ based in the UK) is the first equity crowdfunding platform to be granted regulatory approval anywhere in the world. This post is dedicated to my dear departed colleague and mentor, D. Caplan, who was an incredibly entrepreneurial attorney with his eye on the development of crowdfunding. See also: JOBS ACT: http://www.gpo.gov/fdsys/pkg/BILLS-112hr3606enr/pdf/BILLS-112hr3606enr.pdf; JOBS ACT Q&A http://www.sec.gov/divisions/marketreg/tmjobsact-crowdfundingintermediariesfaq.htm; Proposed Amendments to the Prohibition Against General Solicitation and Advertising in Rule 506 and Rule 144A Offerings: http://www.sec.gov/rules/proposed/2012/33-9354.pdf; CROWDFUND ACT: http://www.opencongress.org/bill/112-s2190/show; http://money.cnn.com/galleries/2012/technology/1204/gallery.crowdfunding-startups/index.html; Medstartr – a health and medical focused crowdfunding platform: http://wp.me/p10nNq-mN; @iplegalfreebies and www.kasterlegal.com. Copyright Law: Using quotes from someone else in your book, blog or website – Using Dr. Martin Luther King Junior’s famous ‘I Have a Dream’ speech as an example of a copyrighted work filled with famous quotes… we take a look at the fair use doctrine and how evaluations are made regarding use of copyrighted content. Music Royalties will start being paid for plays on YouTube – In 2012 YouTube started paying royalties for plays on their website. Copyright Law: Using quotes from someone else in your book, blog or website (part two) – Remember that the HEART of a work is heavily protected by copyright law. Copyright is valuable – ‘The Birthday Song’ earns $2 Million a year in royalties – We all know it… it’s only eight measures long, spans an octave and was written for children …but it’s a big money maker. Understand How You’re Getting Paid – ROYALTIES on GROSS vs NET REVENUE and an ADVANCE – Seeing these words in a contract or agreement will impact payment… become familiar with the meaning of these terms. ‘NAME Brand’ – Using your name as a brand and trademark – Paul Revere may have been the first American entrepreneur to use his name to brand his products. Are you considering it too? Happy New Year! Thank you for reading. Wishing you all the best with your creative and entrepreneurial endeavors. For the latest post see: https://iplegalfreebies.wordpress.com and www.kasterlegal.com; @iplegalfreebies and www.kasterlegal.com. Three cheers for musicians defense against Pandora’s Congressional lobbying efforts to reduce royalty rates that it pays to musicians. Currently Pandora pays a fraction of a penny to musicians each time a song is played on its internet radio service. 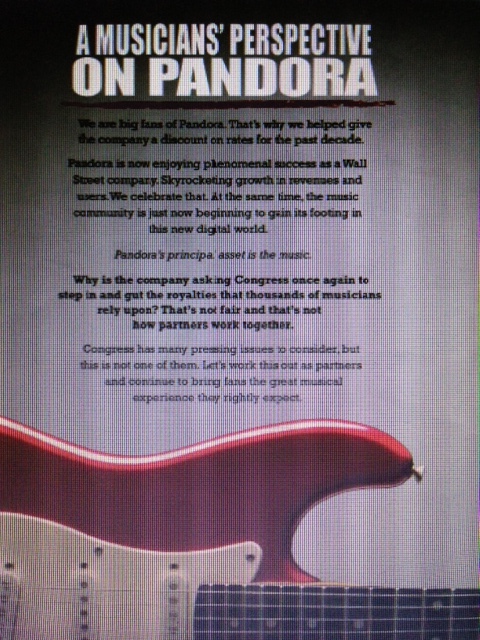 …Pandora wants to make more money (don’t we all)… but taking a bigger cut from musicians is low. In protest of Pandora’s proposal, Rihanna, George Clinton, Billy Joel, Bonnie Raitt, The Doors, Katy Perry, Pink Floyd, Alabama, Sheryl Crow and other artists have written a letter opposing the Pandora-backed legislation that aims to reduce royalty rates. We are big fans of Pandora. That’s why we helped give the company a discount on rates for the past decade. Pandora is now enjoying phenomenal success as a Wall Street company. Skyrocketing growth in revenues and users. We celebrate that. At the same time, the music community is just not beginning to gain its footing in this new digital world. Pandora’s principal asset is the music. Why is the company asking Congress once again to step in and gut the royalties that thousands of musicians rely upon? That’s not fair and that’s not how partners work together. Congress has many pressing issues to consider, but this is not one of them. Let’s work this out as partners and continue to bring fans the great musical experiences they rightly expect. This letter is running in Billboard Magazine and with any luck has gone viral and is gaining momentum and support. A congressional hearing is scheduled for tomorrow in Washington D.C.
For more information: the proposed legislation – Internet Radio Fairness Act; Battling Rihanna Puts Pandora in Box on Lower Music Royalties at http://www.bloomberg.com/news/2012-11-26/battling-rihanna-puts-pandora-in-box-on-lower-music-royalties.html; From Alabama to Rihanna, Starts Fight Pandora on Royalties at http://www.billboard.com/news/from-alabama-to-rihanna-stars-fight-pandora-1008016162.story#/news/from-alabama-to-rihanna-stars-fight-pandora-1008016162.story; and the letter at http://www.musicfirstcoalition.org/sites/default/files/Artist%20Letter.pdf; @iplegalfreebies and www.kasterlegal.com. By comparison, popular trademarks that are used to sell turkeys don’t use the word ‘turkey’ in their mark. For example: BUTTERBALL, HONEYSUCKLE WHITE… and my personal favorite CAJUN GROCER (that sells delicious turducken – http://www.cajungrocer.com). THE SECRET? Words that describe the goods and services that they sell are descriptive and are weak trademarks. In fact, it can be difficult and sometimes impossible to register a descriptive mark with the USPTO for trademark protection. (There is a sliding scale for measuring descriptiveness. Some terms are more descriptive than others. This example of trademarking the word TURKEY (as a brand for turkey products) is a highly descriptive use of the word that overlaps with it’s dictionary definition). The reason behind blocking trademark registration for descriptive terms is logical. Since trademark registration grants exclusive use to the owner… and dictionary words are free for us all to use…. USPTO trademarks are not registered for descriptive terms because this would block words from being used in commerce (by competitors) to describe common goods and services. Back to the trademarks listed above, the popular WILD TURKEY trademark has a fairly strong monopoly on using the word TURKEY to sell whisky and other alcohol products. Similarly, TURKEY HILL is a popular trademark with a fairly strong monopoly on using the word TURKEY to sell ice cream. When creating brands for your business and registering trademarks… remember not to run a-fowl of trademark descriptiveness. Enjoy your Thanksgiving! See also www.uspto.gov; @iplegalfreebies and www.kasterlegal.com. License granted by ASCAP or other rights manager to the club or venue for the performance. Each of these rights gives the holder a monopoly to do certain things or exclude others from doing certain things. Excluding others (ie you with the recording device) can be taken seriously by all the rights holders. For example, club or venue owners can exclude others from recording on their premises. This means they can confiscate your phone until the end of the performance or ask you to leave if you are caught recording a clip of the concert. Technically speaking, recording a clip of a concert for your own personal use is probably considered fair use. If you post the recoded clip to a website, chances are that one of the rights holders listed above will contact the website and request that the clip be taken down. If this happens, the clip will come down and you may forfeit your right to access or use the website where you posted the infringing clip. Rights holders generally try to maintain a balance when it comes to enforcing their rights; since, they don’t want to alienate their fans and patrons. Although, given the history of how aggressively the music industry went after folks who were targeted for illegally downloading music… this could change. See also: Other posts on music copyright at https://iplegalfreebies.wordpress.com/category/c-o-p-y-r-i-g-h-t/copyright-music-copyright/; Music Law 101: Legal Issues Surrounding the Recording and Posting of Concerts, by R. Friedberg; @iplegalfreebies and www.kasterlegal.com. The spooky and haunted WINCHESTER MYSTERY HOUSE is the source of a trademark dispute. Last week, a California appellate court affirmed a grant of summary judgment against Winchester Mystery House, which had claimed that a movie production company had infringed its trademark by making a film, “Haunting of Winchester House,” based on the haunted tourist attraction. QUESTIONS: Does the movie title, “Haunting of Winchester House,” infringe the trademark “WINCHESTER MYSTERY HOUSE”? Does the use of a sketch of a fictional representation of the Victorian-style mansion on the DVD cover infringe the design trademark of the house? Here the plaintiff’s marks identify not only a world famous tourist attraction, but also the property of its former eccentric owner. There was an actual Sarah Winchester, who, according to legend, created a Victorian-style mansion to fend off ghosts. A film that is based on a “true” story will inevitably have a more powerful impact on those who enjoy ghost or horror films. Thus, defendant has used “Winchester House” in its title and a Victorian-style mansion on its DVD cover, which are similar to plaintiff’s marks, and created a fictional work based on the historical figure Sarah Winchester and her allegedly haunted mansion. In our view, where marks have historical significance and similar marks are used in the title of an artistic work or advertising, the Rogers test adequately ensures protection of both the public interest in avoiding consumer confusion and the public interest of free expression. The Rogers test is a two prong test, applied by the court in this case, to test trademark infringement. The first prong requires that the title of the film have artistic relevance to the content of the film (low threshold of minimal artist relevance). Here in this case, both the Victorian-style mansion on the DVD (which is not the actual Winchester House) and the title “Haunting of Winchester House” have some artistic relevance to the film. The second prong of the test requires that the title and cover of the DVD do not “explicitly mislead as to the source or content of the work.” Here in this case, since there is no suggestion that the film was endorsed, authorized or produced by the plaintiff (Winchester Mystery House or Winchester Mystery House, LLC) there is no misleading nor misrepresentation as to the source or content of the film. See also: the holding for the California Court of Appeal, 6th Cir; USPTO trademark registrations 85294333 and 3749783; and www.kasterlegal.com; @iplegalfreebies and www.kasterlegal.com.